Shifeta gives new GPTF Board the thumbs up! Registered users view and access content as well as subscribe to notifications and updates. Register for free to access more content and stay in touch. 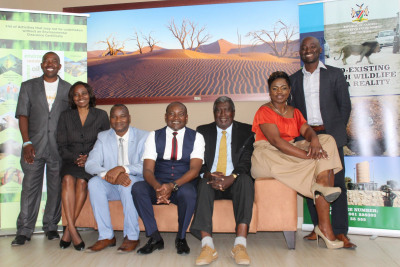 The Minister of Environment and Tourism, Pohamba Shifeta officially inaugurated the Game Products Trust Fund’s (GPTF) new board members who resumed office on 11 July 2018. The fund aims to make grants to emerging conservancies and wildlife councils for the purposes of implementing and maintaining projects and programmes, approved by the board in consultation with the Minister of Environment and Tourism, regarding wildlife conservation and management and rural development. It also aims to allocate funds, subject to the provisions of the Game Products Trust Fund Act, to protected areas, and to persons, organisations and institutions approved by the minister, to be used in connection with projects and programmes regarding wildlife conservation and management and rural development. The GPTF is hosted at the Environmental Investment Fund of Namibia. For more information regarding the Fund and projects financed under the scheme, contact the Fund Manager: Mr. Frans Kamenye, FKamenye@eif.org.na or Tel: +264 61 4317700. Environmental Investment Fund gains unlimited access to extensive southern African climate data base. EIF is a fund created by Act 13 of 2001 of the Parliament of the Republic of Namibia. ©2018 Environmental Investment Fund of Namibia (EIF). All rights reserved.